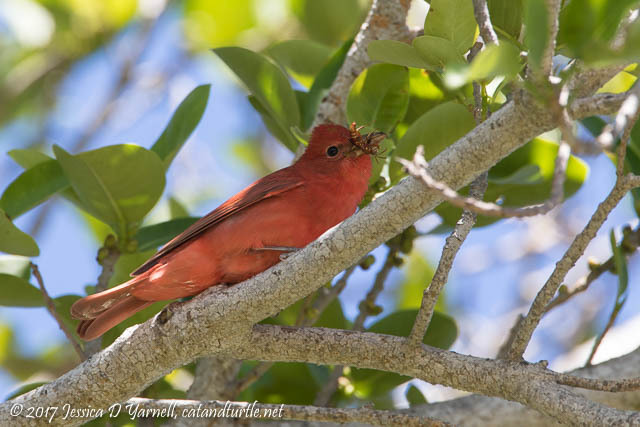 My dad has never seen a fallout at Fort De Soto, and he’s anxious to add some neotropical migrants to his life list. So when we had a front in the first week of April and the birdcast confirmed that there were fallout conditions, we headed to Fort de Soto. Sure, it was a bit early for the migrants, but you never know. Besides, a day out with my dad is a good day, migrants or not! 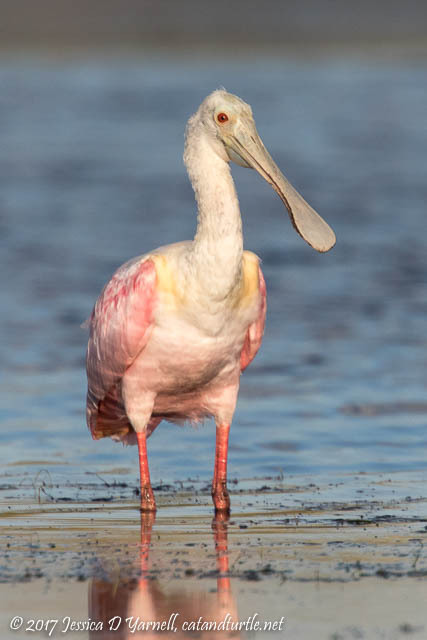 You know it’s going to be a good morning when it starts out with a Roseate Spoonbill at the North Beach lagoon! There were not a ton of birds at the North Beach lagoon, but there were enough to spend a happy hour or so in the beautiful morning light. There were Laughing Gulls, a bunch of White Ibises (in brilliant breeding reds! ), a couple of Marbled Godwits, a Reddish Egret, and the Roseate Spoonbill. 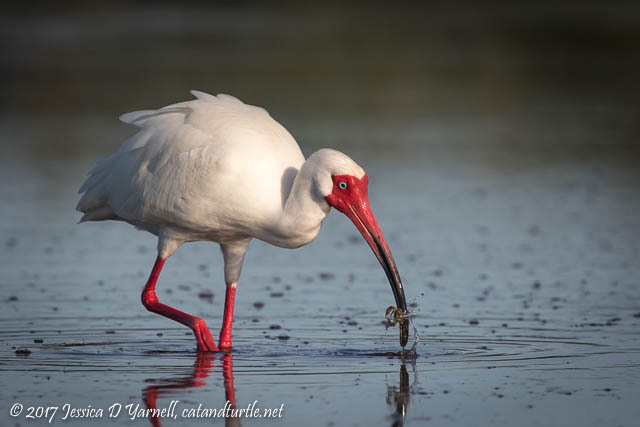 At first the ibises were just feeding in the water quietly. Then two of them decided to do some courtship moves, something I’d never seem before. 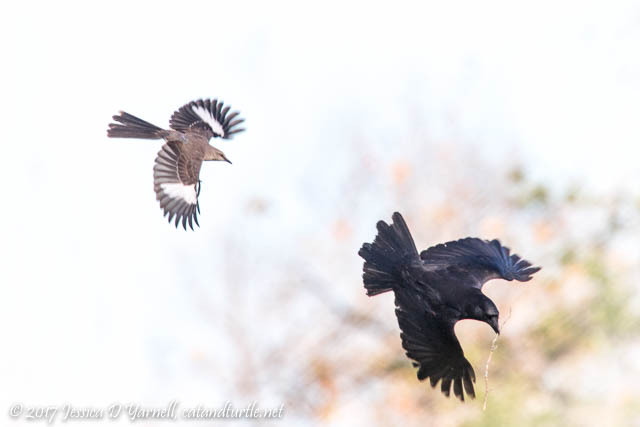 Both birds rose into the air and showed off their aerial skills. I think they impressed each other. 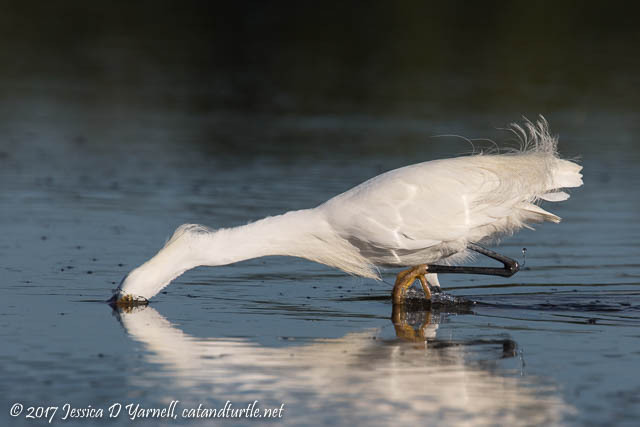 A lone Snowy Egret flew in and started showing off his lacy breeding plumage. He walked slowly in the water, wiggling his feet and trying to find his breakfast. Then suddenly he reached out his long neck and plucked a fish from the water. 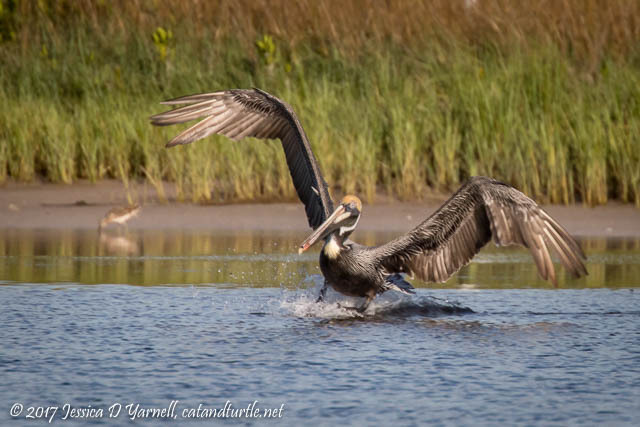 One of my dad’s favorite birds at the beach is the Brown Pelican, and at this time of year, they are especially pretty in their breeding colors. This one flew in across the lagoon and grabbed a mouthful of fish. 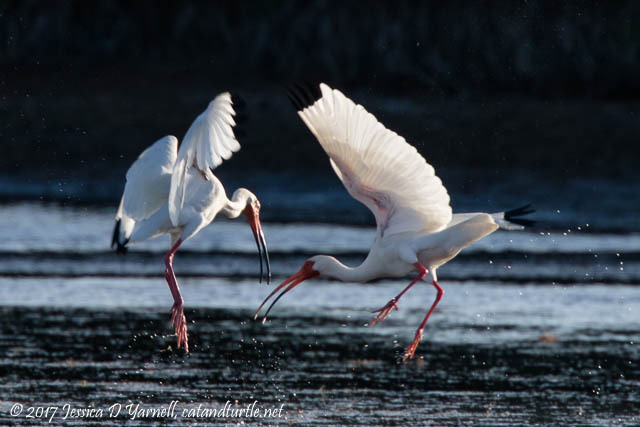 After their courtship dance, the White Ibises continued feeding. Look at that bright red face and legs! They too were searching for crabs for breakfast. This one scored! 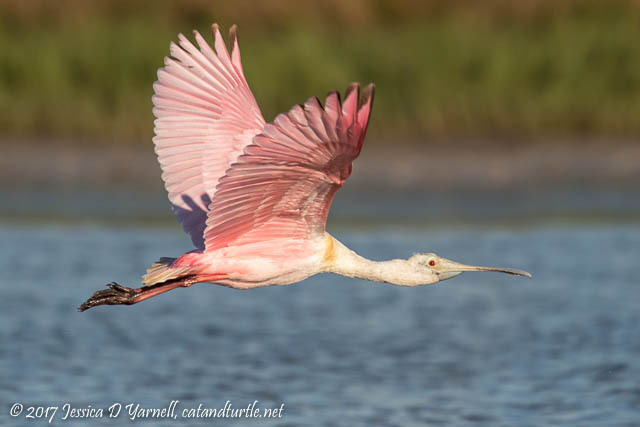 The Roseate Spoonbill made her way up and down the lagoon, then took flight. Look at the mud on the tips of her wings! She needs to take a good bath. Orange! 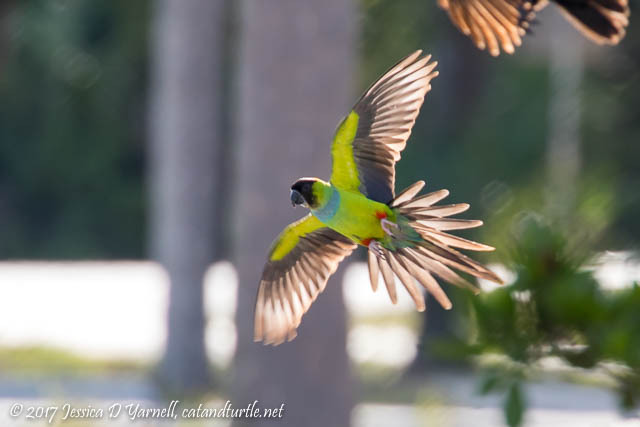 Migrant spotting! 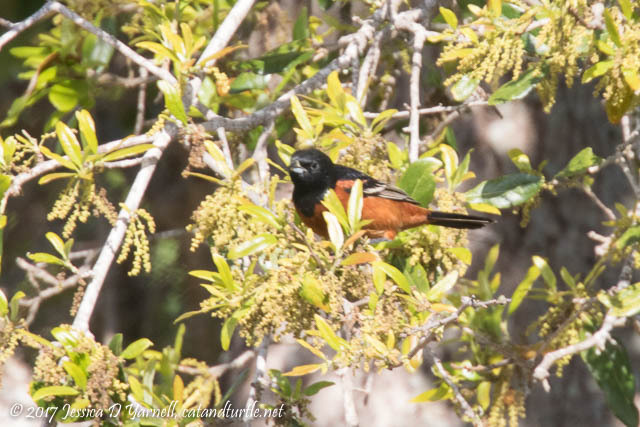 A male Orchard Oriole was hanging out in a tree at the end of the parking lot. My dad was so excited. 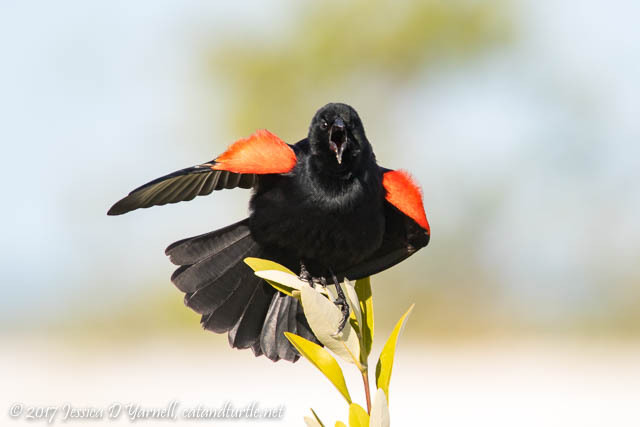 Unfortunately the bird didn’t stay long, but he did pose for my dad’s camera as my dad’s lifer Orchard Oriole! Next we headed to the mulberry tree area by the ranger’s house. 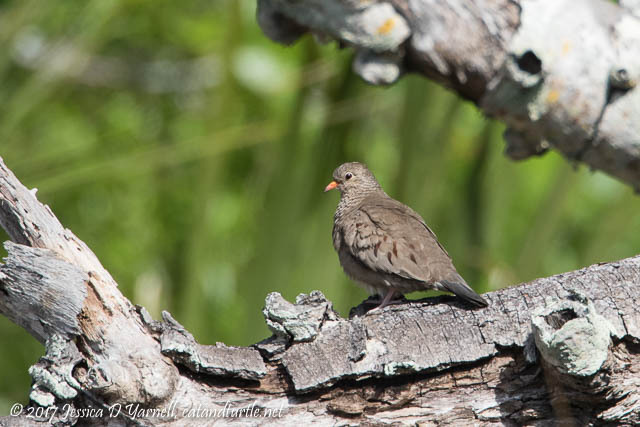 The first bird we saw was another lifer for my dad – a Common Ground Dove, who obligingly hopped up into a tree to pose for the camera. We sat by the foundation for a little while without seeing much. Terns flew overhead, an Ibis came in to drink. 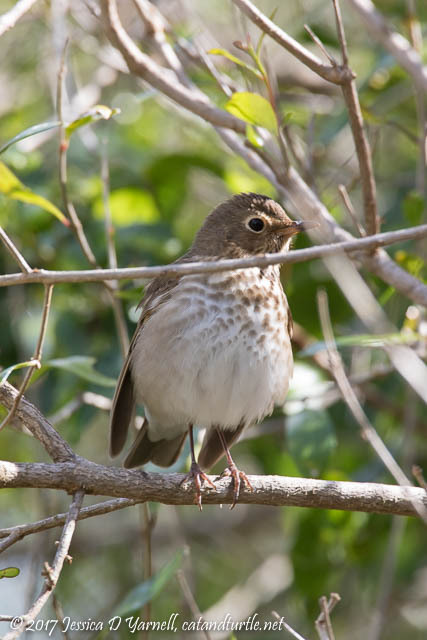 Then a Hermit Thrush popped out on a branch right in front of us. Cool! People passed us saying they had seen a Summer Tanager and an Orchard Oriole. We walked around and then my dad saw the red bird that wasn’t a cardinal…and he had a huge wasp in his mouth! The wind was starting to pick up, so we headed to East Beach hoping that the bay side would be more protected from the winds from the gulf. 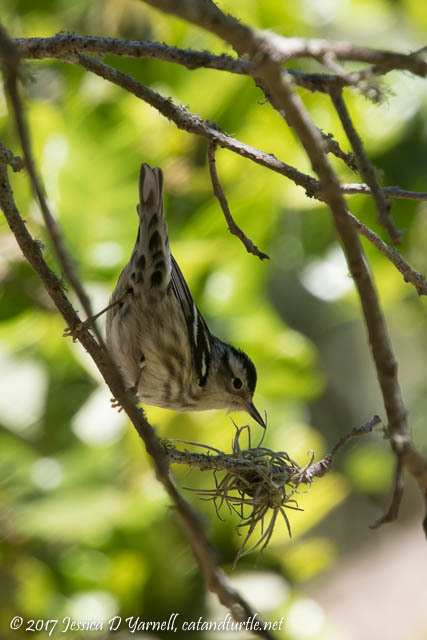 As we walked through the parking lot, we spotted a Black-and-white Warbler in the oak trees.